When considering your altar, your options are truly limitless. Don't feel confined to the usual floral arch or mandap or hanging draping adorned with greenery garlands - while they look amazing, they aren't the only floral options for your altar. In today's #Fridayflorals post, we discuss some of the other floral options for your altar. A stunning tree can bring history and fortitude to your ceremony. A stunning tree which has aged for decades to stand tall and proud before you both, anchoring your nuptials in its inherent strength and solidity. Occasionally though, unless your tree is a Willow, your photos will show only a bare trunk behind you, missing the beauty entirely. 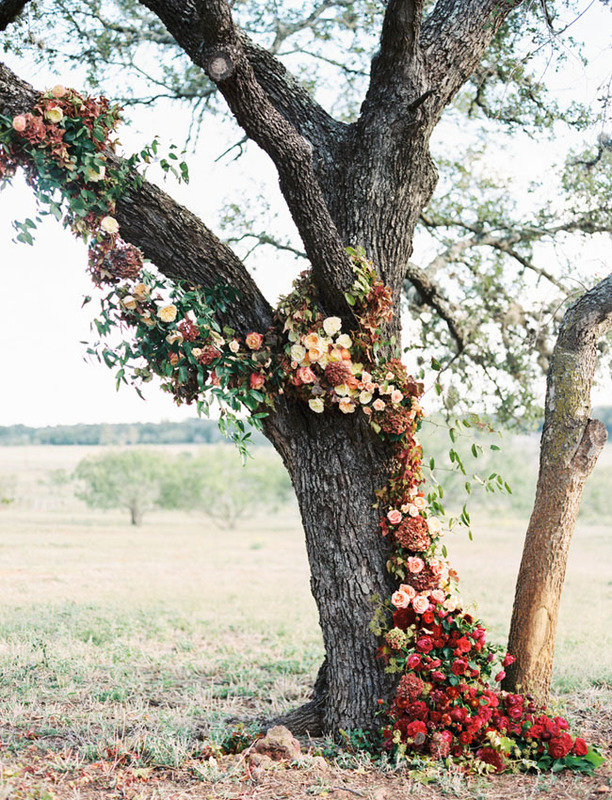 This is where a floral garland fits in perfectly. It can be styled to follow the lines of the tree perfectly, framing the parts you wish to enhance while not overpowering the altar space. We love the example in our hero image above showing a Fall inspired wedding, combining Fall leaves and autumnal hued blooms for a truly striking floral garland. Often for outdoor weddings, your venue will have limited options as to where you can be wed. Sometimes, when confronted with a plain wrought iron gate, it's easy to fall into the overly-pinned images of latte toned draping and greenery garlands trailing to lanterns or floral arrangements in vases of differing heights but while that option is certainly beautiful - hence all the coverage on Pinterest, why not take advantage of the structure the gate gives you, to really embellish the iron with a selection of glorious florals? We love this example - simple, elegant, carries the eyeline but not enough to take the focus off the Bride and Groom - the perfect background for your ceremony photos. The Hanging Altar works best in spaces where there is no real defined altar nor any ability to bring something in. Industrial spaces where you've opted to eschew draping can benefit from the hanging altar due to the high steel beams making it a cinch for hanging decor. This example has just taken one corner off the traditional wedding arch which nicely complements the formation of your bridal party, yourselves and your celebrant as a treat for the eye while not crowding the altar. A similar idea to the Hanging Altar, the Hanging Hoop Altar marks the ceremony position like a halo above the both of you. The Hoop Altar can either be solid and lavish or simple and trailing depending on the look you're after. It mimics the feel of a gazebo encircling you proudly at the forefront of the reception space while offering you the freedom to create whichever formation best suits your wedding party. There's a fine line when it comes to decorating an altar with garlands between 'Wedding' and 'Christmas'. Too much greenery can speak solely to the latter while a spray of flowers at the centre of the mantle and some candelabras at the base can make it look more matrimonial than 'merry'. We love the idea of taking an existing fireplace or opting for a salvaged fireplace surround and decorating it with a lavish floral garland. Another alternative, is to hang individual blooms by their stems - either at a singular height or differing ones depending on the desired look. For this, choose sturdy stemmed blooms and opt for a flower that won't wilt too immediately in the heat. If your saying "I Do" under the hot summer sun, we'd avoid white flowers at all costs unless they're sheltered as the heat will swiftly turn those stunning avalanche white blooms a dull shade of bruisy brown. White tulips or roses however would look incredible hung by their stems indoors where it's cooler and accented perhaps by some hanging tealight globes. Carnations, Hydrangeas and Roses are the perfect choice for individual stems while something bushier like Wisteria provides a romantic and truly striking, trailing hanging arrangement. Remember, we love to help you plan your wedding, whether you're a client or not. Our aim is to take the stress away from your wedding so please send through any questions, qualms or worries and we'll help you to soothe those wedding dramas.